This post is part of our special coverage WikiLeaks and the World. Sahara Reporters is an online community made up of “citizens reporting the news and writing reports without barriers, oblivious of borders and regardless of frontiers“. The consistency and temerity with which SR has exposed corrupt public officials in Nigeria has earned this online medium a legendary stature in the country. By clipping down the gate keepers and allowing air into the public domain, Sowore's SR has and continues to, unmask the big masquerade that milks the common good of one of Africa's largest nation. Global Voices Online: What is SaharaReporters and how did it start? Omoyele Sowore: SaharaReporters was created to be liberating tool for communities under siege from tyranny and oppression. By asking citizens to “report themselves,” our idea was to create both a news platform and, more importantly, a media movement making use of a wide range of technological innovations in order to freely exchange information – especially information that liberates and expands our democratic space. This concept of SaharaReporters was many years in the making. It was formally established in 2006. GV: With your background, no one should be startled with the whistle blowing status of Saharareporters. Nonetheless, one cannot but ask what pushes you to remain consistent with this great but also perilous job? OS: I started down this path at the tender age of 10. Since that time, I have faced many dangers and death threats, but the greater threat in my opinion is to leave our societies in the hands of unscrupulous individuals who run our nation states into ruin. The fact that our simple demands for decent conditions of living and civil rights are met by state-sponsored threats and orchestrated violence makes clear why things can’t continue the way they are. GV: How does SaharaReporters recruit citizen reporters? OS: Over the years, we have built a relationship based on values and conviction with citizens in the trenches, on the streets and the frontlines who, often at personal risk to themselves, share news tips, photos, videos, documents and other items that would be censored or ignored in the government-approved news media. In hopes for a better and safer society, they step forward to give their time, resources and energy to report for SaharaReporters. These great “citizen reporters” come forward not looking for pay but to be part of a new media voice that cannot be muscled, compromised or intimidated. GV: How do you sift out the truth from the numerous inputs you get from your ‘citizen reporters’? OS: We have published close to 5,000 reports since 2006 – which we closely read, critically checked and double checked. The new thing we bring to the table is evidence-based reporting. Often, our reports are based on raw evidence, sometimes highly sensitive evidence. These stories are read and checked by “citizen verifiers” and citizen editors; the next stage is citizen publishers. GV: Has SaharaReporters or its journalists been in trouble with the government? Have they received death threats or any other forms of intimidation? OS: It is hardly a surprise that intimidation, threats and harassment come with the territory of our work. We tend not to pay attention. In their efforts to silence or intimidate critics, government created a “security threat” list at all points of entry and exit in Nigeria and placed our names at the top of the list. When Mr. Goodluck Jonathan came to power, his aides approached me to ask that we apply to have our names removed from the list. Our response was simple – whoever put our names there, could just as easily have the names removed. I told the contact I knew we would soon be back on the list so long as we kept up our corruption exposés. They have bombarded our network, trying to bring it down with denial of service attacks. 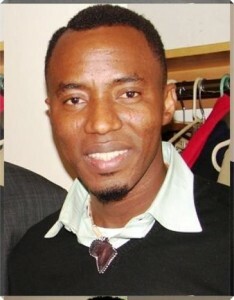 Punitive libel lawsuits have been filed against us – quietly encouraged and sponsored by Nigerian officials in the US. Two such suits are still pending with a combined value of $75 million in damages sought by two lawyers involved with Nigerian embassy real estate deals in New York, Maryland and Washington DC. GV: What do you think is the future for online investigative journalism in Africa? OS: Online journalism will thrive because it affords anonymity and safety from the risks and dangers faced by regular journalists. However, its success over the long term will depend on the level of commitment of the news practitioners and the support from the community. The Internet alone is not a sufficient force for change. GV: What are the greatest achievements of SaharaReporters to date? OS: Some reports have saved lives and others have inspired series of actions and reactions. What has really made a difference are the never seen before videos, photos and texts that are published by SaharaReporters in ways that have profoundly changed the media landscape as well as the Nigerian society. As far as a major achievement, I think our reports on the corrupt former Delta State Governor, James Ibori, which I started on another platform in 2005 and continued on SaharaReporters, were the most devastating. We started with a visit to his mansion in London to discover his Bentley parked in a garage and continued with the story until his extradition to the UK last month. I’m also proud of our reports on the noxious oil spill by ExxonMobil in Akwa Ibom State at a time when the Gulf oil spill in the U.S. was major news. Just as the US media was showing flamengos dripped in crude, we brought out several photos of wild dogs, birds and fishermen affected by the spills. Somehow, the world didn't pay enough attention to the story and ExxonMobil got away with it – in our tradition, it was a great story. Equally important was our exclusive reporting on the prolonged illness of former Nigerian leader, Umaru Yar'Adua and his eventual death. The series of reports we did was of great benefit to the Nigerian society and other reporters in Nigeria as we had facts and figures that were detailed and on point. Yar'Adua died in May 2010 just as majority of the mainstream media in Nigeria claimed he was getting better and planning to resume back to work. Also in December 2009, we got the attention of the world by providing reports that were the first to identify the Nigerian “Underwear Bomber” Farouk Abdul Mutallab including the first ever real photo of him that eventually ended up on CNN and the BBC. GV: Does the fact that Sahara Reporters is an online news source make it easier for you to deal with sensitive stories? OS: Most newspapers and journals have online versions now. What makes SaharaReporters stand out in the crowd is the lengths we go to present hard-hitting investigative reporting, surprising to some for the quantity and quality of information presented. As Wikileaks has done to a media uproar, we are challenging government secrecy and championing the public’s right to know. GV: How come SR always breaks the news, especially those that other mainstream Nigeria media tend to avoid? OS: The mainstream media in Nigeria has run its course; its years of courage and bravado are now long in the dust. Run by so many rich barons, they have become lazy and complacent. In my years of student activism, the Nigerian press was so powerful it was the institution that people turned to for deliverance from the military. But the mainstream media sadly is a shadow of its former self, reeling from its self-inflicted tragedy occasioned by compromises. GV: Do you think the Nigerian press is free? Kindly give the reasons behind your stance. OS: The Nigerian press was once free – they fought for that and gained respect because they took on the military. That freedom is now lost to selfishness and the power of the (king’s) purse. GV: Evgeny Morozov’s Net Delusion asserts that the Internet is doing more harm than good for democracy. Some have seen governments also hiring bloggers and planting news in the blogosphere. Is the Internet an agent of change or just “cyber-utopian”? OS: Like every innovation, the Internet could be a force for good or bad, it could promote new ideas or misinform people, it could be a force for liberation or put people in information lockdown. But overall I think it has done more good than harm. The internet is the new form of virtual democracy. It has opened new frontiers for citizen participation in governance. That it delivered four revolutions in the Middle East in less than a month is not too bad! As to government attempts to plant stories, it has never worked and it won’t work. The internet soon reveals the truth, as when government tries to secretly insert itself in any discussion. On SaharaReporters we see that all the time, it comes mostly from those who announce in every commentary that they are neutral, balanced and objective. GV: The Omidyar Network – established in 2004 by eBay founder, Pierre Omidyar and his wife Pam – recently gave a grant of $450,000 to SR. What are your plans? OS: Coincidentally, I bought my first laptop for SaharaReporters on Ebay for $600. This latest grant is spread over three years. We plan to start working on making SaharaReporters a full multimedia outfit online. About a month ago we launched SaharaTV, from where we discussed and reviewed the Nigerian elections live online. It was a powerful experience. GV: There have been muffled accusations that SR sometimes tends to exaggerate or is unbalanced. What is your reaction? OS: Everyone is entitled to their opinion and I challenge you to find a news organization with whom no one finds a flaw. If a reader finds us unbalanced or biased, their views are welcome on our pages. There is no official line and unlike other news sites, we publish views with which we might disagree. GV: How do you intend to allow more ‘sunlight’ into the Nigerian public sphere; breaking the ‘single story’ by mentoring many more Sowores – who would not ask for their right but grab it? OS: What we experience on the website is a dynamic interaction of different thought processes, a clashing and mixing of ideas, where you publish a report and people come forward to dissect, redirect and make additions and sometimes provide better ideas than the original report. Sometime you watch a story develop and through this participatory infusion of ideas, it grows a life of its own. I am seeing better writers and reporters on the site every day, making measured comment. The real mentors are the readers and commentators, they are my mentors. It is not the other way round. GV: What would you like to be remembered for? OS: That I challenged my countrymen and women to step up to the plate, that I provided a venue for them to come forward, tapping the courage inside them and using the wonders of this new technology to demand their rights and demand that justice be done to their share in the great wealth of Nigeria that is legitimately ours.